As young people around the country are organizing action in response to the shooting in Florida, students in Boston and around Massachusetts are planning an anti-gun violence walkout and lobbying effort on March 14. The protest will be one of many around the country that same day, following the lead of students in Florida, who say they’ll leave school for 17 minutes to memorialize the 17 people killed in the mass shooting at Stoneman Douglas High School on February 14. Youth organizers at high schools around Massachusetts say they will leave class, then head to Boston for a day of lobbying at the State House, where they’ll call for a tightening of state gun laws. The current plan, subject to change, is to meet near the State House at 10 a.m., give speeches, then march inside to speak with lawmakers. The young organizers, who are working with the Massachusetts Coalition to Prevent Gun Violence, want the protesters who plan to descend on Boston to think big picture, says 16-year-old Michael Martinez, who lives in Roxbury and is a junior at Weston High School. Policy goals, he says, include passing so-called “red flag” legislation, which would let family members or law enforcement file “extreme risk protection orders” in court to seize firearms from people deemed dangerous. It’s not yet clear how school districts, including Boston Public Schools, will react to the students’ plans. 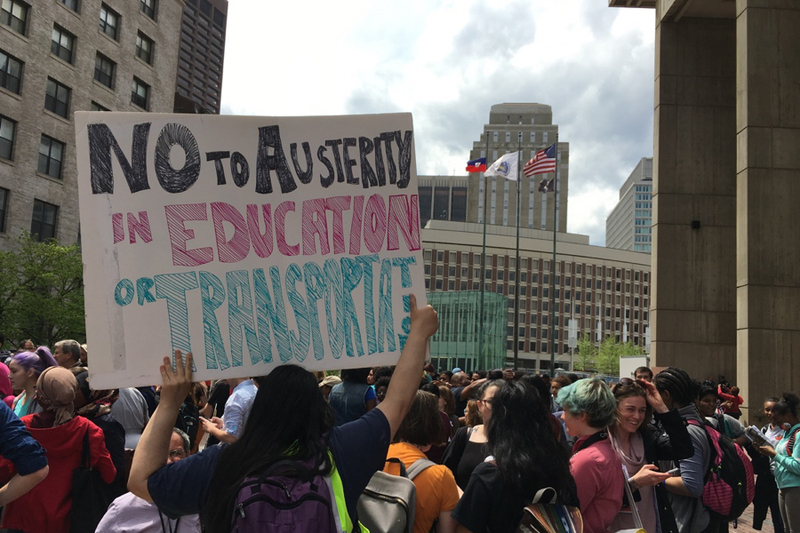 In the past, when Boston students organized walkouts over school funding, Superintendent Tommy Chang and Mayor Marty Walsh discouraged the teenagers from leaving class. A BPS spokesman said he was not in a position to comment yet. In response to threats of punishment in other school districts, local colleges—including MIT, Smith College, WPI, and UMass Amherst—have said they would not hold it against students in their college applications if they are suspended for taking part in a walkout. A separate protest, also led by students, is being planned for Saturday, March 24, in Boston. Called the March for Our Lives, the rally is being organized in conjunction with the youth branch of the group behind the Women’s March. Already, nearly 40,000 people have said on Facebook they’re interested in attending. Students are currently out on February break, but before that, there had already been plenty of activism inside Massachusetts schools. Last week at Andover High, for example, 17-year-old Charlotte Lowell posted on Facebook saying she planned to walk out of class on Friday afternoon and stage a sit-in at the school’s cafeteria. Seven hundred of her peers followed her. It really feels like their efforts could lead to change this time, she says, and anyone who’s underestimated how much a bunch of teenagers can accomplish should probably think again.